I thought from now on, I should begin addressing these blog posts to my family members as well as everyone else. I'm sure 1 or 2 of them are following this, ha ha. Today I thought I'd give you all a word of warning. This past week I read what I thought was a stand alone novel which will remain nameless, and author-less. For the most part it was somewhat boring in the first 4 or5 chapters, but it got more interesting as I kept reading. The first thing this author did wrong was NOT starting with the main character getting into some kind of trouble, or "terrible trouble," as Dean Koontz often said in his book, "How to Write Best Selling Fiction." The story begins with a lot of background information, or an "info dump" as we writers call it. Maybe I could have tolerated it for a while, but it went on for several chapters. I was about ready to give up on it. The real story didn't begin until the main character went to a party where the hostess was someone who hated the MC and vice versa. Now, that perked up my interest a little bit. But the unforgivable sin she left with was ending the story with a cliffhanger, then told reader he/she had to purchase the sequel to find out what happened next. She dropped the story off right at the climax, leaving the reader hanging. Of course, I'm not going to purchase the sequel. The author blew it in my mind and I will probably never read another book of hers. I'm just glad it didn't cost much. 1) Always begin your story with the main character being hit (figuratively) with some kind of "terrible trouble." 2) Never end a story at the apex of the climax with no resolution and expect the reader to purchase your sequel. In my mind, it ain't gonna happen. So, until next week, as always, if you like this blog, please remember to "Share" and "Like"it on Facebook , and "Retweet" it on Twitter. Then PLEASE, take five minutes to write a review and post it on Amazon. Also have you signed up for my email letters on my Blog Site? I would love to see you there and have you introduce yourself and give comments to this blog. 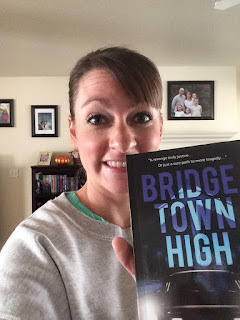 And also keep in mind "Bridgetown High" is still available on Amazon, Goodreads and Barnes&Noble and several other places I can't remember. You can read some GREAT reviews of Bridgetown High on Amazon and Goodreads in case you need more info about Bridgetown High.